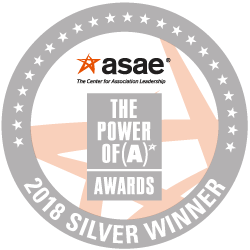 LEXINGTON, Ky., Wednesday, June 20 - The National Association of State Chief Information Officers (NASCIO) has been named a Silver Award recipient in the 2018 American Society of Association Executives (ASAE) Power of A program for its Deloitte-NASCIO Cybersecurity study. The Power of A awards recognize associations that distinguish themselves with innovative, effective and broad-reaching programs and activities that positively impact America and the world. The Deloitte-NASCIO Cybersecurity study, a biennial report begun in 2010, details how states are managing cyber risks. Throughout the years the study has continued to gain visibility, with this most recent release being cited in the White House's FY19 Budget Request as the most "comprehensive study of state-level cybersecurity spending." Noting the significance of the study to NASCIO members, Elayne Starkey, Chief Security Officer for the State of Delaware shared, "The Deloitte-NASCIO Cybersecurity study is incredibly helpful to states for measuring and comparing our progress against other states. The study has assisted Delaware in addressing and preparing for current and future cybersecurity threats." As Meredith Ward, NASCIO Senior Policy Analyst and project lead stated, "I'm so very proud of this study, the success of which is directly tied to the dedication and participation of our state Chief Information Security Officers (CISO). They are an incredible group of individuals who work day and night to protect our states. I look forward to releasing the newest iteration of the study this fall where, for the first time, all 50 states participated." A full list of Power of A award recipients for 2018 can be found on the ASAE website.